Beans are extremely satisfying seeds. They are large and germinate easily. They can be harvested young and eaten soft – like limas, favas, and green peas – or in their fresh pods, like green beans and sugar snap peas. They are most beautiful and useful when allowed to mature and dry naturally. They are creamy white, chestnut, blue-black, or pink; mottled, speckled, cow-spotted, or black-eyed; fat and reniform, or shaped like a lens or a ram’s head. They can weigh down pie crusts or fill bean bags. Food co-ops everywhere are built on the cornerstones of bulk bins full of colorful dried beans. Running your hands through a bowl of cool dried beans is an inexplicably simple joy. This time of year news outlets like to report that beans are a traditional food for the new year because beans look like coins. Maybe they do a little bit, if you lack depth perception, but most people would mistake beans for coins about as easily as they would cabbage for a dollar bill. I think beans are perfect for the new year because a good collection of dried beans makes a person feel both rich and lucky. Just like optimism, beans are cheap enough that anyone can have them. They are easy to store and last longer than a human lifetime (at least 200 years, according to research from Kew Gardens). If they aren’t cooked, they can be planted to make more of themselves. They may be simple and earthy, but they generate wealth. Do these look like coins? Beans are also perfect for eating this time of year. After weeks of elaborate rich food, something easy and healthy is very appealing. Beans have been paired with rice in just about every culture that has adopted farming. 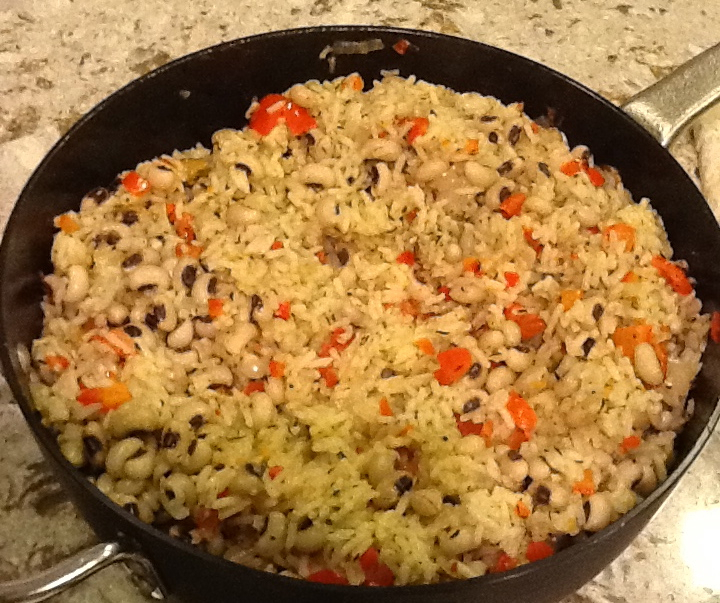 It’s a great combination, and one of my favorite traditional versions for the New Year is hoppin’ john. It may have originated in some Caribbean cultures as a dish made with pigeon peas (pois au pigeon, very roughly pronounced “hoppin’ john”), but most people I know use black-eyed peas (Vigna unguiculata), and that’s what I use in my recipe below. 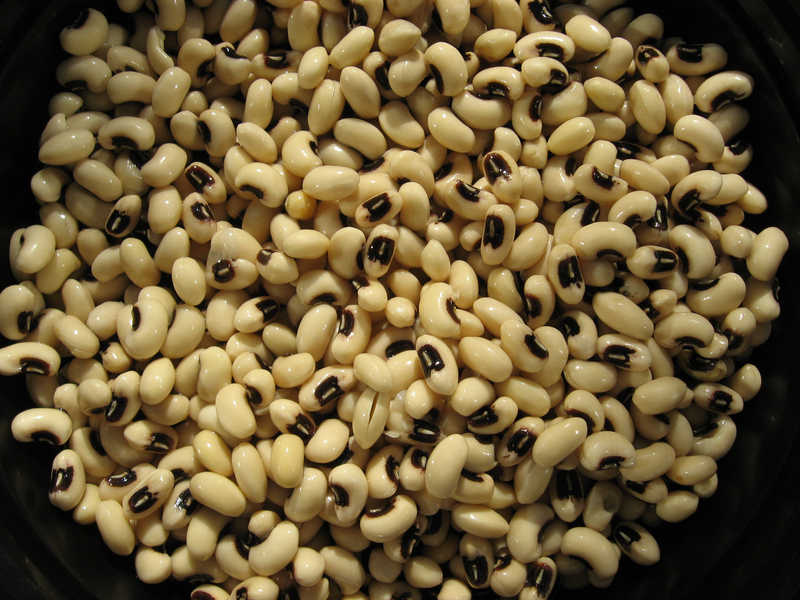 Black-eyed peas probably evolved in Africa (Delgado-Salinas et al., 2011), and they are close relatives of mung beans, cowpeas, and Chinese long beans. All of these species have more box-shaped seeds and longer narrower pods than common Phaseolus beans, the New-world group that includes string beans and black, white, and kidney beans, among others. If you remember learning anything about plants in elementary school, you probably remember growing beans, and it was probably boring. It’s a wonder anyone goes on to study plants anymore. But should old acquaintance be forgot? I say absolutely not. Dried beans are amazing creatures, and you likely have a pile of them alive but sleeping soundly in in a jar in your cabinet right now. Of all the things living in there, beans may be the only things you really want to know about. Dried beans are seeds of legume plants, and seeds are far more complicated than they look. Like two-faced January, they bridge the winter gap between last fall’s harvest and next spring’s planting. Seeds also kicked off one of the most important periods in plant history. When the first seeds evolved, plants finally gained a bit more freedom to reproduce without staying wet all the time, which turned out to be a great strategy. Seed plants have flourished in the 370 million years since then, and now the vast majority of plant species are seed plants (flowering plants and gymnosperms). Legumes (family Fabaceae) evolved fairly recently, just over 60 million years ago, yet is now one of the largest and most diverse plant families in the world (approx 18,000 species). Jeanne will turn her fabulous phylogeny machine on the beans in a future post and bring you more details about their origin and distribution. For now, I’ll focus on bean structure. Black-eyed pea soaked and split. The seed coat is on the right, showing the black eye around the hilum. The two cotyledons are on the left. Seeds are more than just a plant embryo and its sack lunch, bundled together and tossed optimistically into the wild. Seeds contain three distinct generations and a jumble of genetic material: the seed coat belongs to the mother plant; the nutritive tissue (endosperm) contains an unequal mixture of maternal and paternal genes, with the balance tipped towards the mother plant; the embryo itself gets half of its genes from each parent; and in gymnosperms the seed contains a generation intermediate between the parents and the embryo, called a gametophyte. (In flowering plants, unfertilized seeds – ovules – contain gametophyte cells too.) These various players have distinct interests, and you might even say that there is a war raging inside our peaceful looking little seed. Many of those genes direct resource allocation and the synthesis of storage materials, which should align the interests of the embryo itself and both of its parents. The maternal plant, however, has more than just this one selfish seed to provide for and must spread resources accordingly; while the paternal parent takes the side of the embryo, since it may not be the father of any of the other seeds on the plant. These conflicting genetic interests seem to have driven some important aspects of seed evolution (see work by Friedman for discussion). Seeds pack a lot of resources into a small space to fuel the transition of the embryo to an independent seedling. Orchid seeds are one exception. They are minuscule – think of the specks in vanilla bean ice cream – and when they germinate, they recruit fungi to bring the resources to them. Most seeds, though, contain a lot of starch, protein, and some fats (e.g. “nuts”). Many also contain defense compounds, such as lectins, tannins, and cyanide precursors. Bean seeds also contain a lot of oligosaccharides, sugars like raffinose and stachyose, that make some people fart. That’s because mammals lack the enzyme α-galactosidase (α-GAL) needed to digest the oligosaccharides ourselves. We pass them along to the bacteria in our large intestines, which gratefully accept the sugars and break them into CO2, methane, and other gases. We then pass these along to the outside world. Protein is not cheap for plants to make because it contains a lot of nitrogen, which is often limiting for plants since they cannot get it from the air. Carbohydrates, by contrast, are relatively cheap because carbon dioxide is abundantly available to be fixed through photosynthesis. The reason beans and other legumes can afford to be particularly high in protein is because their roots house symbiotic bacteria that turn atmospheric nitrogen into something a plant can use. Beans are generally about 22-25% protein by weight, whereas even whole grains contain only one-third to half that much. Should old acquaintance with elementary-school botany have been forgot, the diagram below may bring it back to mind. It maps the structure of a bean seed onto the seedling it will become. The bulk of a bean seed is a pair of cotyledons, or “embryonic leaves.” These leaves serve the dual purpose of storing the starch and sugars, proteins, and fats needed by the young plant before it becomes independent; and turning green and making some new sugars once the seedling emerges from the soil. The cotyledons enclose the main axis of the embryo, with the nubbin of a root (radicle) at one end and a little leafy shoot at the other. It is not easy to see, but the cotyledons are actually attached to the axis between the root and the shoot. Soaking a bean in water will soften it enough to be split, revealing the main axis of the embryo inside. I should take a moment to note that not all flowering plant species rely on their cotyledons for storage. The seeds of most flowering plants make a specialized nutritive tissue called endosperm, which results from double fertilization and contains genes from both parents, but mostly the maternal plant (see above). In some plant species, the endosperm is present in the mature seed. The white part of popcorn is endosperm, as is coconut water and coconut meat. 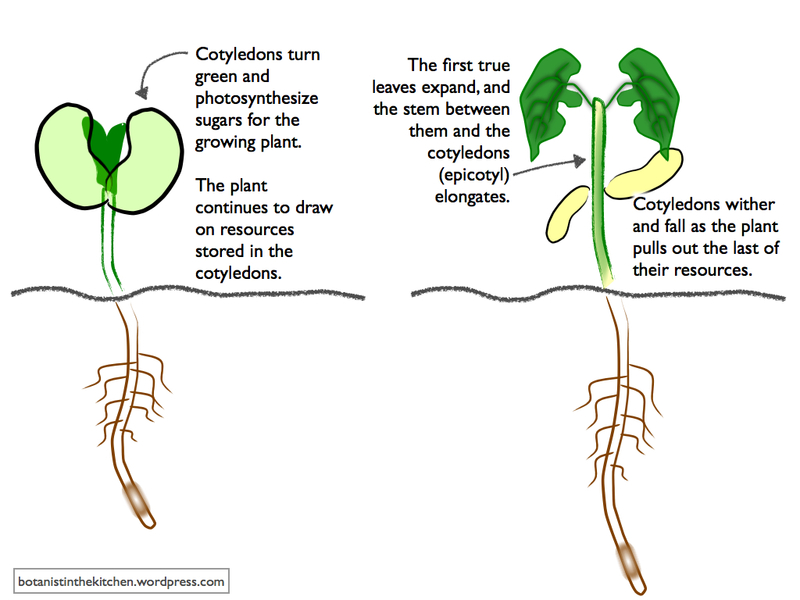 In beans and some other plant groups, the contents of the endosperm are taken up by the cotyledons and stored there. Soaking bean seeds is the first step to sprouting them for eating or planting. 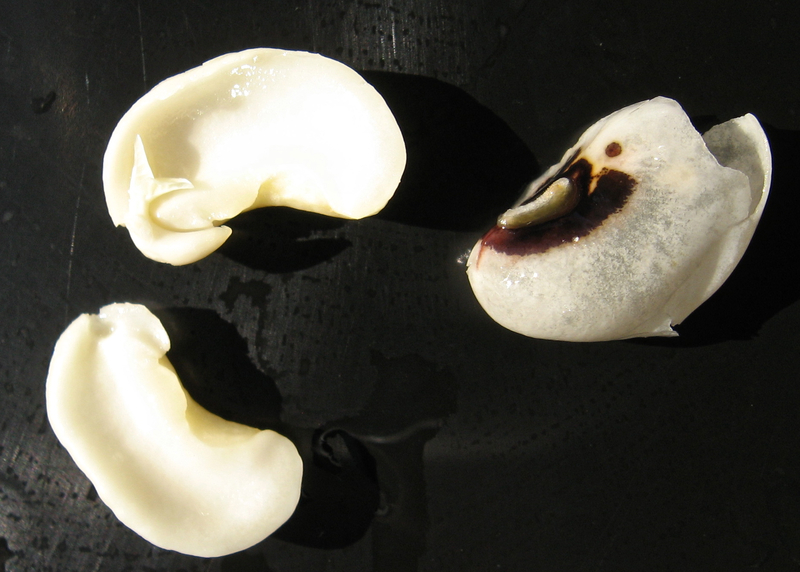 When a bean seed takes up water, it breaks its dormancy and starts a complicated physiological process. Starch grains swell, cells enlarge, and the seed coat is broken. Enzymes begin to digest complex molecules to be used by the growing seedling. Seeds are full of mRNA molecules (instructions from the DNA for making proteins) that may allow very rapid synthesis of proteins needed early in germination. As far as I know, the black eye of the black-eyed pea does nothing for the seed. It simply surrounds the hilum, which is the plant version of a belly button, marking the point where the seed was attached by a funicle to the inside of the pod, or ovary wall. For me, the purpose of the eye is to be striking against a melange of white rice and red peppers. It also reminds me to be grateful for my harvest while looking forward to a new season of growth. Now, let’s get it started in here. The ratio of ingredients may vary, but I like to use equal parts dried beans and rice. Soak two cups of dried black-eyed peas in water to cover by several inches. After a couple of hours, drain and replenish the soaking water. After a couple more hours, drain the soaking water, rinse the beans, and cook them with several bay leaves for about half an hour. The beans should be cooked through, but not too soft. Drain the cooked beans and rinse with cool water to stop the cooking. When they are thoroughly drained, return the beans to the empty pan and cover them with about 2 T of good olive oil plus salt and fresh black pepper to taste. You can multitask as you do this first step. Sauté a large onion and two or three red bell peppers, chopped, in olive oil with some crushed red pepper and a generous amount of thyme. Fresh thyme is best, but about a tablespoon of dried will work. Add two cups of nice white rice to the pan and stir to coat with oil. Add about 2t of salt and more black pepper. A dash of liquid smoke is nice. Cover with four cups of water and cook until done, about 20 mins. Gently stir in the black-eyed peas. Adjust seasonings if necessary. Serve with tabasco sauce. Hoppin’ john goes really well with kale (or more traditional collard greens) and some hard cheese. Leftover hoppin’ john is good reheated, room temperature, or thinned into soup. You can make fritters by mixing it with enough egg to hold the mixture together, breading small patties, and frying them in a skillet. This entry was posted in Recipes, The basics, Uncategorized and tagged Fabaceae, fruit structure, Katherine Preston, legumes, morphology. Bookmark the permalink. In addition, I especially enjoyed learning the botanical basis of farts! I always appreciate the science and the food, but this time the pop culture reference in the title was delicious too!